The Honest Sailor, Sr Peter Warren Kt of the most Honourable Order of the Bath, Vice Admiral of the White Squadron, of His Majesties Fleet, And Member of Parliament of the City & Liberty of Westminster, artist unknown, c1746, National Maritime Museum. 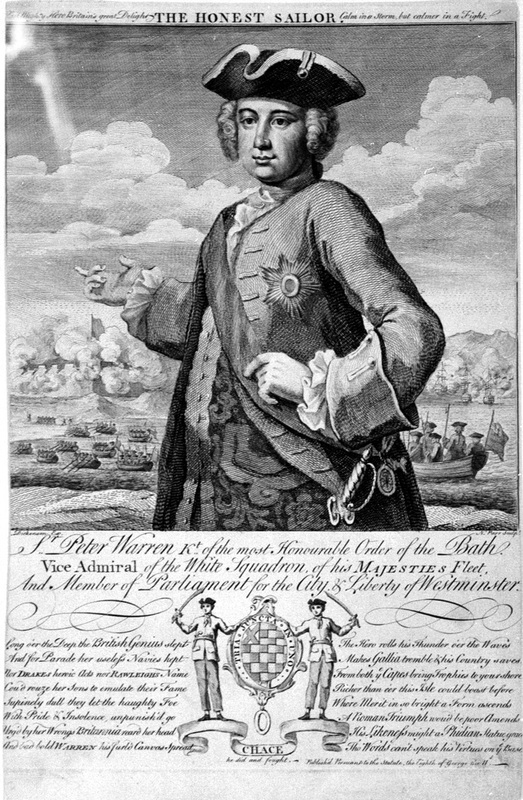 Sir Peter Warren was an Irish officer in the Royal Navy, who met with astounding success. Warren made his career in the New World, sailing and fighting from the Caribbean to Nova Scotia. His most famous victory is portrayed in this print by an unknown artist, who shows Warren casually pointing over his shoulder to the amphibious assault on Louisbourg. Warren commanded the British squadron that blockaded and supported the siege, while New England troops (who he thought little of) manned the guns, dug the trenches, and did the fighting ashore. Seizing Louisbourg ensured British victory in North America. Interestingly, the same strategy (a naval blockade supporting ground troops who seized Lighthouse Point on Cape Breton Island to bombard the town into submission) was used with success in 1758. Beneath the portrait of Warren is his coat of arms. 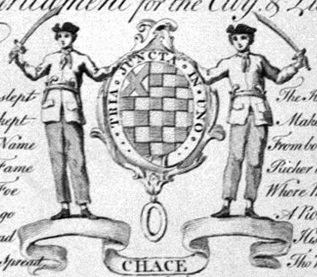 To either side of it are two seamen bearing dual pistols in a belt and a cutlass shaped like a scimitar. They wear the same slop clothes: a cocked hat over bob wig, short closely tied neckcloth, close fitting single breasted jackets with flap pockets at the waist, and a darker pair of trousers that ends about the bottom of the calf.